We live in a social-media driven society. Whether we use Facebook, Twitter, Instagram or Linkedin, it has a profound impact on our everyday lives. Over the past several years, social media has expanded from personal to professional use, allowing us to communicate our thoughts, ideas, goals and experiences. 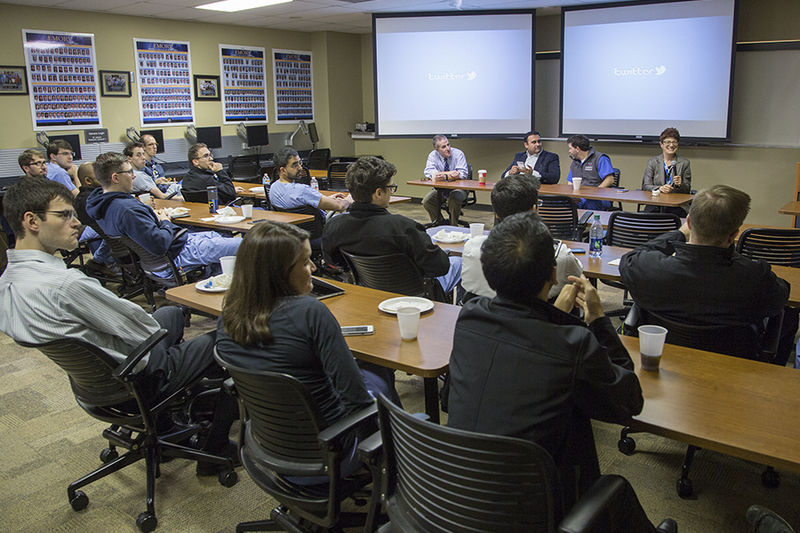 On November 19th, Dr. Carolyn Meltzer led the 1st Twitter/Social Media Panel discussion for Radiology Residents. The panel included Drs. Rich Duszak, Falgun Chokshi and Matt Hawkins. Their goal was to educate residents about the various uses of Twitter as a tool of communication, networking and education. They also addressed the skepticism of Twitter and what individuals should be mindful of. Radiology Residents were able to ask questions regarding the functionality of Twitter and how the panelists use it within their profession. Dr. Duszak, who has over 13,000 followers, shared that Twitter is a great networking tool and a way to share ideas and thoughts within the radiology community. It also allows one to stay up to date with the latest literature, news and major conferences. The panelists encouraged residents to follow colleagues and organizations in radiology and to start building their network.